Often referred to as “Symbol of Multiculturalism”, “Monument to Multiculturalism” by Francesco Perilli, is located in front of Union Station at 65 Front Street West and was unveiled on July 1st, 1985 by then Toronto mayor Arthur Eggleton. Fifty eight years after the opening of the “new” Union Station, this piece fits seamlessly into the Beaux-Arts style of architecture that characterizes the building. Although the “main square” of a city can traditionally be seen as its heart, the central train station probably deserves similar respect. The title of this statue reinforces what Toronto has become and is the first piece of public art seen by those arriving to the city by rail. I seem to recall there was some controversy about this sculpture, I was at OCA at the time. scott> I recall that as well (hearing about it later — at the time I was a tween) — something about it being political, plunked down without the usual processes. Hazy memory — perhaps somebody remembers. As the photos clearly illustrate, the major drawback with this sculpture is that seagulls are only too willing to give the man a facial. This, unfortunately, would be a problem with most any sculpture. For example, Winston Churchill certainly has a reason to look so grumpy at Nathan Phillips Square! The speech is a beautiful and relevant sentiment, even today. A lot of people should give a real read to those words and take them to heart. 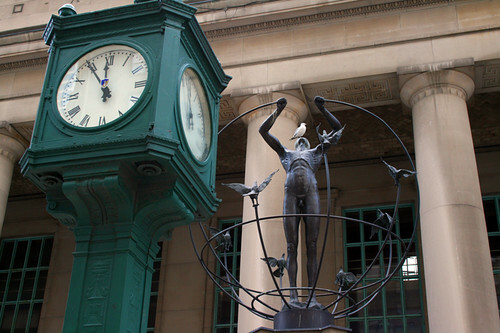 The sculptureÃ¢â‚¬Ëœs placement in front of Union Station presumably acknowledges the fact that the wave of Italian immigration to Toronto after World War II saw most of them arriving in the city by train. The controversy was over the fact that the sculpture was regarded as trivial by the panel of art experts appointed by the city who felt that it didn’t measure up to the grandness of the site. Rather than ruffle any politically correct feathers, City Council decided that it would remain there for one year, then be moved to somewhere else. It’s still there, probably forever. Although you wonÃ¢â‚¬â„¢t be seeing it for the next several months while the city rebuilds the plaza in front of the station, which is actually a bridge over the roadway underneath it. I was confused then stunned when I realized it’s the exact same statue. After some research, I now think it makes it especially cool that we have one of four of these around the world. I find it ironic that this statue claims to be multicultural but it really references ancient Greek sculpture…the body of the man in the middle is distinctly European in shape. And, he is a man…what about the female counterpart to this species? Though it’s a beautiful statue, I think this statue speaks more about Perilli’s artistic influences than it does about multiculturalism :P.